During photosynthesis, trees use sunlight to convert water and carbon dioxide into sugar (food). As autumn approaches, the sunlight begins to decrease and temperatures start to drop. In preparation for its winter rest, the tree’s photosynthesis process declines as well, causing a reduction in the production of chlorophyll. As less and less chlorophyll is produced, other leaf colors become visible. The intensity of certain colors can change each year, depending on the temperature. When sunny days are followed by cold nights, more red will appear in the leaves. This is because the cooler temperatures in the evening inhibit the flow of sugar to the leaves, branches and tree trunk. Yellow, orange and gold colors will remain the same level of vibrancy regardless of weather fluctuations. Leaves will turn brown when the weather gets too cold. 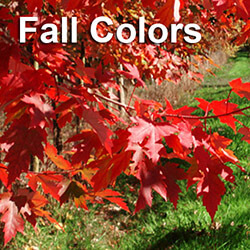 Maple tree varieties often have the broadest range of fall leaf colors. 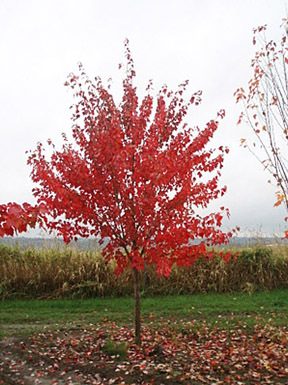 The October Glory maple, also known as the scarlet maple and red maple trees, are fast growing trees with leaves in brilliant shades of burgundy and crimson. They can reach heights of between 40 to 50 feet, with a spread up to 35 feet. During the spring and summer, the leaves are a shiny dark green. The blades of the leaf are approximately 2 to 4 inches in length. October Glory maples do well in most soil types, including sand, loam and clay. 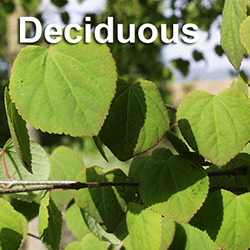 The tree is frequently used in landscaping for shade and screens. The Red Sunset maple can grow up to 60 feet in height, with a spread of up to 40 feet. During the fall, the tree’s leaves change from green to orange and red. Red Sunset maples also grow quickly – approximately 2 feet per year. Although they prefer full sun, they will also grow in the shade. Vine maples are native to the Pacific Northwest. 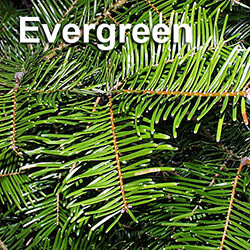 This beautiful, small tree is also a fast grower, reaching heights of up to 15 feet with multiple trunks and a spread of up to 20 feet in width. During the fall, the tree’s foliage turns scarlet and orange. Vine maples are an excellent landscape tree, with their showy leaves, purple and white flowers and scarlet samaras (dry fruit). The autumn blaze maple also has spectacular fall color, turning from a rich green to orange and crimson. It has the vigor of a silver maple combined with the beauty of red maple trees. 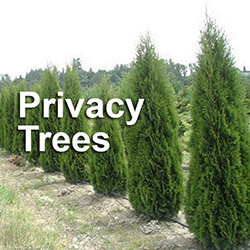 The tree grows up to 60 feet tall with a spread as wide as 40 feet. 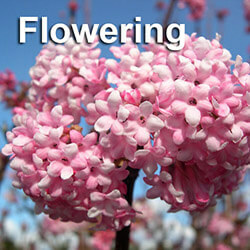 It is another fast grower, with dense and healthy branching. 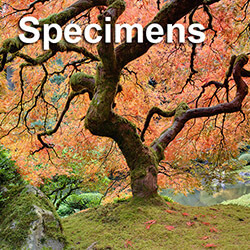 If you are looking for a tree that will add color to your landscape during the fall and winter, contact a Seattle nursery trees big tree specialist to find out what trees will grow best in your planting environment.